Life Sciences. Antarctica has a range of cold adapted organisms many of which are found nowhere else, some of these are the basis of commercially important fisheries. Antarctic ecosystems are generally isolated from the immediate presence of man, they can be studied to find if changes are the result of local conditions or as a result of environmental change that may also affect ecosystems elsewhere. 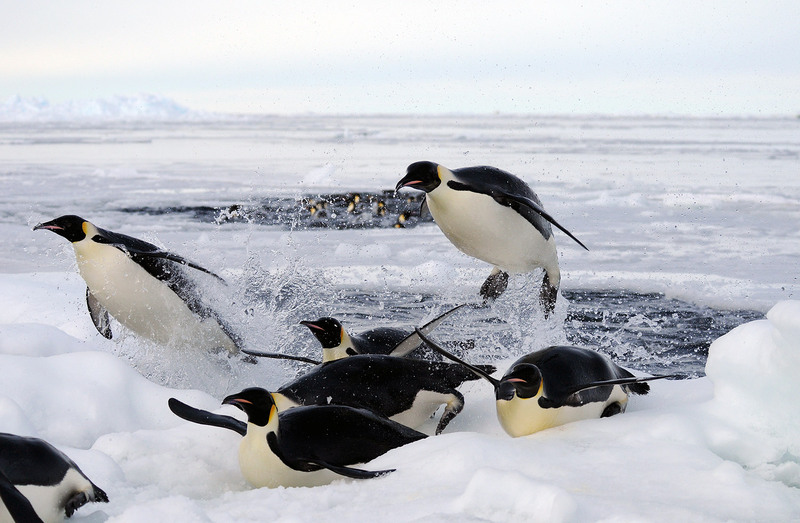 Antarctica has some of the most cold adapted organisms on the planet, how do they do it? and what can they teach us about the mechanisms of physiology and survival? Some of these organisms are already dealing with greater effects from climate change than anywhere else, how successfully are they doing this and what can we learn about how those elsewhere might cope? Despite the cold Antarctica is home to a huge number of living organisms from the charismatic megafauna in all those great pictures you've seen to many small and intensively studied land invertebrates that you won't find unless you actively look for them, to a whole host of marine animals that we are discovering are more numerous and diverse than we ever thought. 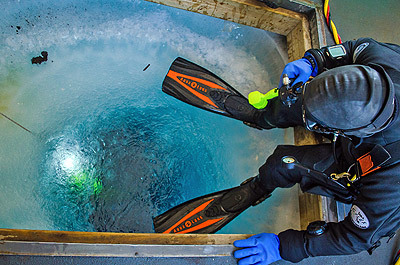 The biological sciences can be carried out virtually anywhere in Antarctica. 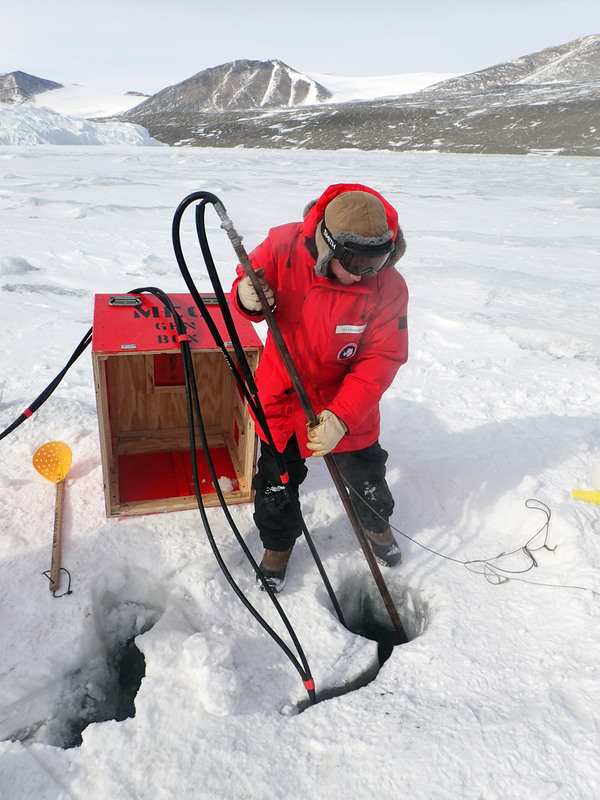 While some projects require great resources of ice strengthened ships to venture to remote areas with unpredictable sea-ice and the use of robot submersibles, others can be operated by a single researcher on a scientific station with little specialist equipment such as measuring long term trends in penguin populations to collecting and recording samples for analysis back further north in the home-country labs. 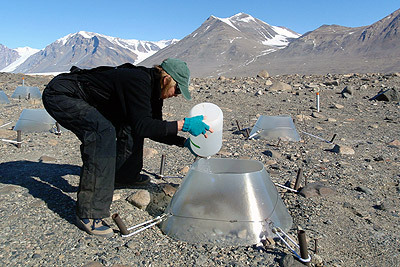 Here are some life science research projects taking place now or recently in Antarctica. 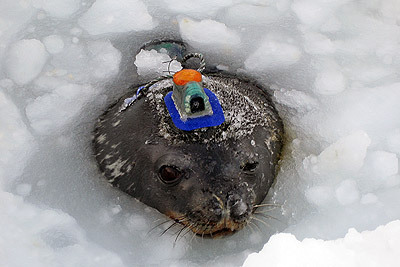 A Weddell seal with a camera and data recorder. This films what the seal sees when diving, it also measures depth and position and sends a three dimensional record of the seal's dives. With satellite connectivity such data recorders are now used through the winter months and record information such as temperature and salinity too. The seals are recruited as scientists to gather data at times when it was previously impossible. The recorders are fixed in place with glue, they don't harm the seals at all and fall off after a few months. There have been a great many studies on penguins starting in the earliest days of Antarctic exploration when expeditions would find often as not that there was a penguin colony within a short walk of their hut if not actually on their doorstep. Penguins are highly visible and widespread animals in the Antarctic, they show little or no fear of man and are generally indifferent to human presence whether it be a nearby scientific station or researchers or tourists walking nearby, they feed at sea and nest in large colonies on land. Put all these things together and they become animals that are almost going out of their way to make it easy to study them. 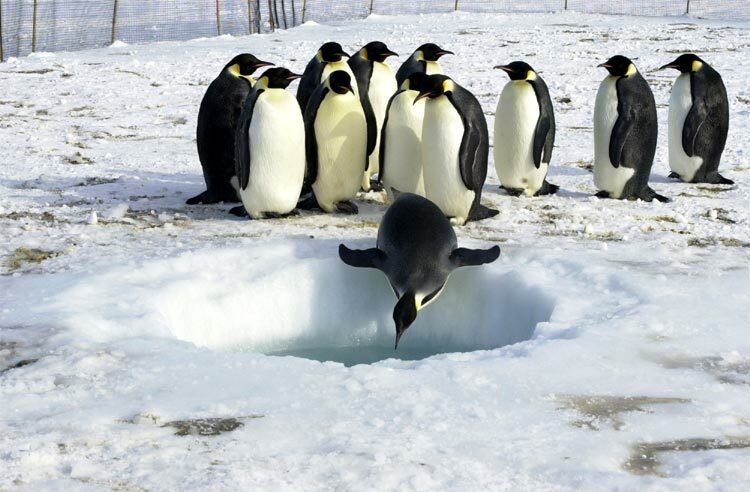 An emperor penguin's heart-beat goes up from 60-70 beats per minute (bpm), to 180-200 bpm immediately before a dive as they load up blood and muscle with oxygen, on hitting the water, this drops to 100 bpm and then slows to just 20 bpm for most of the dive. They used stored oxygen in the blood and muscles during the dive, with no ability to get more from the lungs, there is no need for a fast heartbeat. Back at the surface, the rate goes up to 200 bpm to pay back the "oxygen debt" they have incurred during the dive, dumping accumulated carbon dioxide and topping up oxygen carriers again. 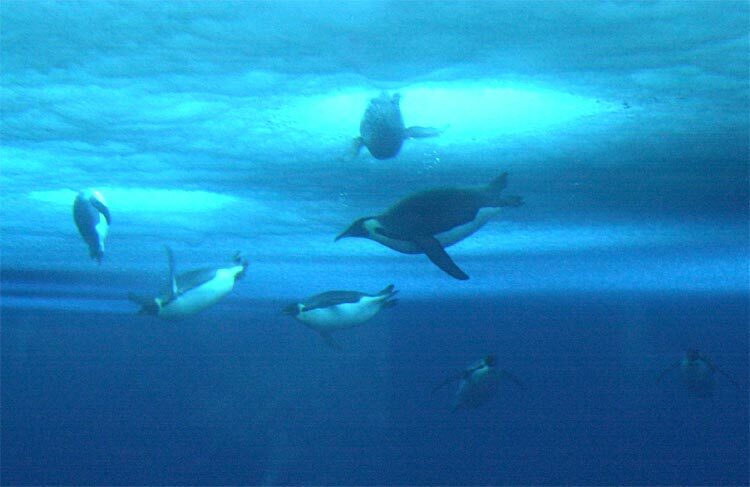 Penguins are higher predators in their food chain, they feed on seafood, mainly fish and krill. 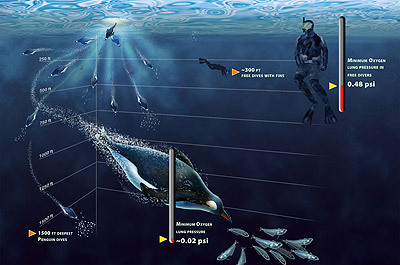 Different species can have different feeding strategies, deep or shallow dives, near-shore or off-shore and may seek out different prey species. 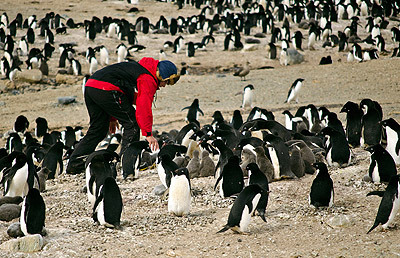 As well as studies that tell us about the biology of the penguins themselves directly, longer term studies on established penguin nesting sites (that have been shown to be hundreds or even thousands of years old) can tell us about what is happening further down the food chain as well as penguin populations and breeding success are connected with food availability. Penguin counting at a distance - Antarctica is a big place, it's a continent, if it was a country it would be the second biggest after Russia and about 40% larger than Canada the second largest country, It is also by far the least populated continent and so sometimes big things can go un-noticed, such as penguin colonies. Emperor penguin colonies in particular can be difficult to see as they are on sea-ice and are only occupied during the breeding season, outside of this there are no birds and the ice may break up and float away, at least land-based colonies are still recognisable even if the birds aren't there. 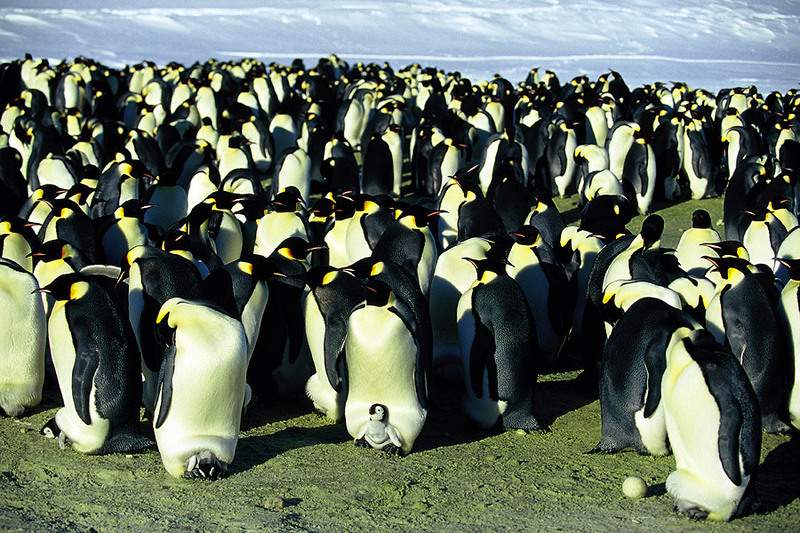 Many emperor penguins breeding colonies are in Eastern Antarctica which is the least densely populated and most rarely visited region of an already very sparsely populated and little visited continent. 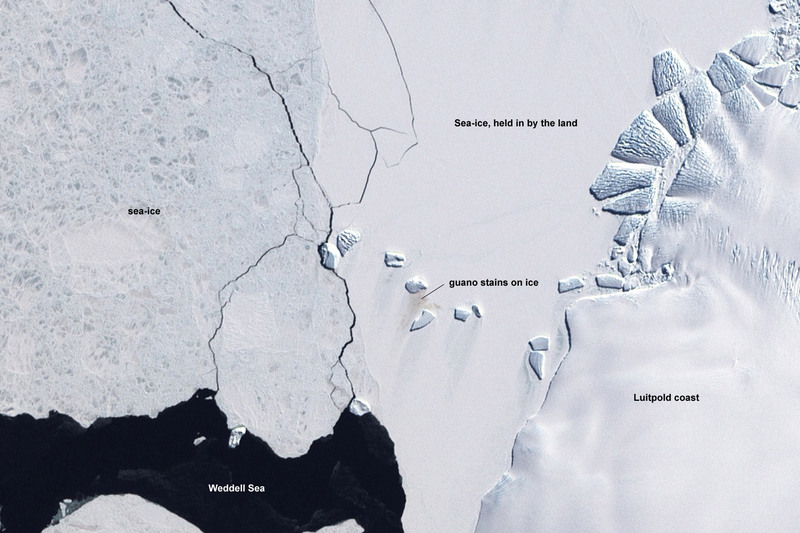 In recent years one of the best ways of identifying remote colonies is from space. The colonies are identifiable from the guano (poo) that colours the ice an unpleasant greenish yellow colour. In the duration of a colony, the penguin group may shift about over quite a large area so covering a huge area with guano that makes them visible on satellite photographs. A number of previously unknown colonies have been spotted in this way, and the existence of old colonies last visited decades ago has been verified or otherwise by more recent photographs. Antarctica on the surface can often be a landscape of black, white and shades of blue. Beneath the sea however, this can become a brightly colourful world with a great biodiversity of marine invertebrates in particular that in recent years has been found to go against the long prevailing view that the ecosystem diversity was much less than in warmer waters. There are many studies on these organisms. 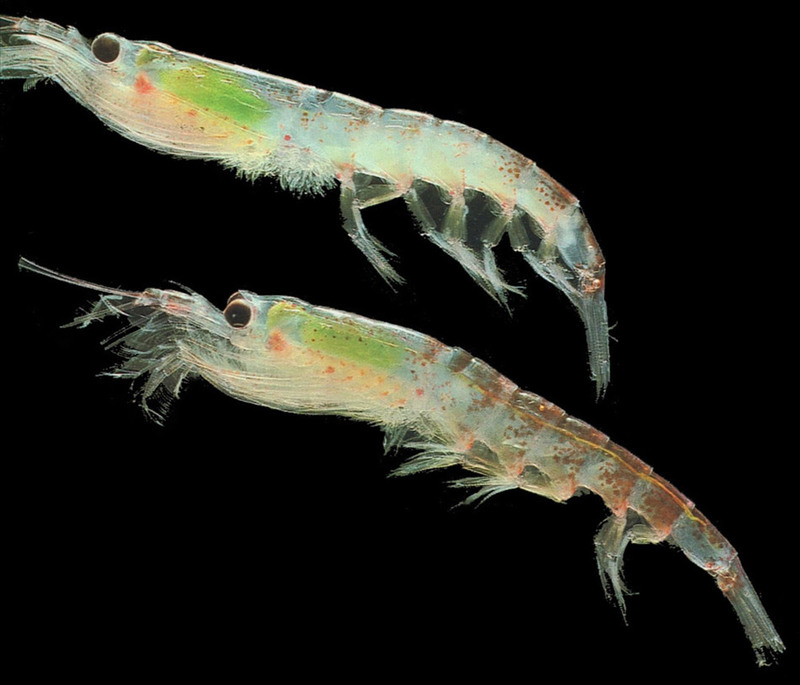 Krill have also been found to be important in the global carbon cycle with effects for climate change. They feed at the surface, taking in carbon as food and then slowly parachute downwards when it goes through their system and they poop out the waste at greater depth where the carbon stays over a much longer time period, they are responsible for a method of long term carbon capture. 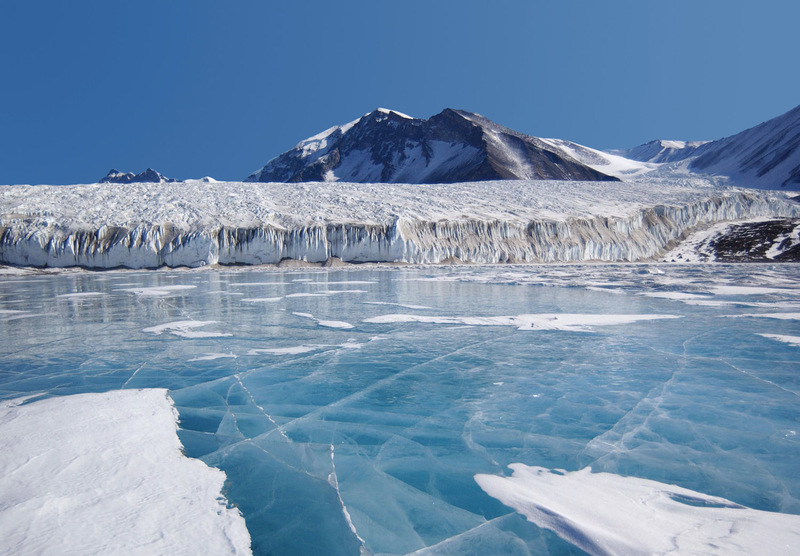 A long standing study across much of Antarctica is that of Limnology. This is the study of inland waters, everything other than the sea. In Antarctica this usually means freshwater lakes and ponds which are frozen over for part or all of the year, it is a multi-disciplinary study encompassing biology, chemistry, physics and geology, all of which affect the characteristics of the water bodies over time. Lakes and ponds anywhere offer an opportunity to study fairly easily an enclosed microcosm that is relatively little influnced from the outside, those in Antarctica are minimally affected by the activities of man compared to the rest of the world and are almost ideal study subjects as changes here can be detected that would be masked elsewhere. Some Antarctic lakes are seen as sentinels of the effects of climate change, as temperature changes can be 2-3 times that of surrounding areas. 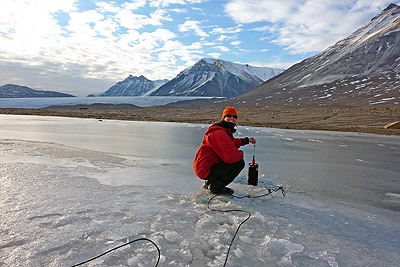 Measuring phytoplankton (plant plankton) at Lake Fryxell, a permanently ice covered lake in the dry valleys regions, it is about 20m deep with a covering of 4.5m of ice, though the shoreline can be clear of ice in the summer months. An experiment in the dry valleys where despite appearances, there really are some living organisms. Soil bacteria are being given measured amounts of water at intervals and are protected from the wind, their respiration is then mreasured. Drilling a hole through sea ice to reach the Ross Sea. 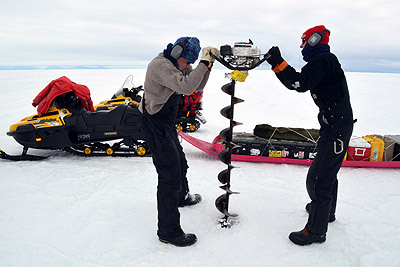 An ice surface makes the sea and lakes easier in some ways to work on without the need for boats, though reaching the water itself can present other problems. 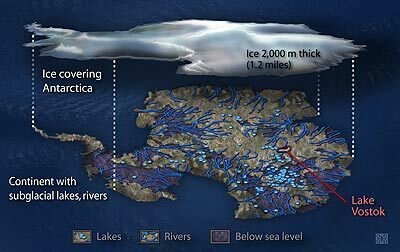 Like anywhere, lakes in Antarctica can vary enormously in size from less than a metre in depth to several hundred metres and from a few square metres to many square kilometres. The largest lake in Antarctica is Lake Vostok which is deep inland, it averages 430m meters deep and has a surface are of about 12,500 square kilometres, it is particularly difficult to visit however as it is covered by about 4km of ice, the lake itself is situated beneath the Antarctic ice cap and the bedrock, it is the world's sixth largest lake by volume and is one of 400 so far known lakes found beneath the ice. It is thought that these lakes may be interconnected to some extent by under-ice seasonal rivers. Lake Fryxell, fed by summer meltwater from the Canada Glacier seen behind the lake.